Angelfire's design and functionality are about to receive a major upgrade. The new Angelfire.com is here! The plan is to replace the existing design with one that's more contemporary and that uses the latest Web technologies. 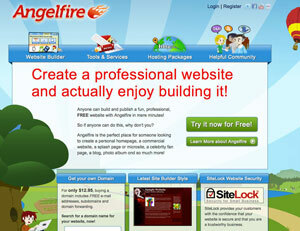 Also, from here on out Angelfire will focus more on the Site Builder tool. Here is a screen shot of an early mock of the upcoming design...as you can see it's quite different. The new Angelfire also will involve the Angelfire community more. Like our sister property, www.tripod.com, (which got its own design upgrade earlier this year) Angelfire now has a Facebook page and a Twitter Feed. We'll also be a lot more active in the Angelfire Club...interacting with our users and fielding questions. Nothing you currently have access to will be eliminated. However, new users to Angelfire will not have access to the Blog or Photo Album features because they will be replaced this year by Add-ons in our site builder. We had a really positive response from the Tripod community following the upgrade earlier this year and we're confident you'll agree our changes make the site more attractive and much easier to use and navigate. We will be releasing the redesign of the web page the week of September 27th. PS. This website was built using Angelfire's Webshell HTML editor!